There are few things in this world that are better than a fresh, crusty French baguette smeared with salty butter. I’ve learned to bake many breads in my kitchen, which really makes me proud – because dough, of any variety, was something that terrified me for a long time. Even once I was confident in my bread making skills, baguettes always just seemed out of my league. A couple of weeks ago I started binge-watching The Great British Bake-Off, and the baguette episode piqued my interest. Santa had brought me a baker’s couche for Christmas – that I’m ashamed to admit was still setting in it’s package. I resolved to kick my fears to the curb and give it a go – you’ll never tackle anything new if you don’t at least try! Well, I’m happy to report that my fears were unfounded and incorrect on pretty much all of those fronts. Sure, the whole process does take a whole day – as in 24 hours. You start off making a “poolish” overnight , which is pretty much just a fancy word for a starter. The next day, that starter is then dumped into the other ingredients to make the dough, which has a couple rises ahead of itself, as well as shaping and final proofing – before being put in the oven. I used the same process when I made Italian Bread – it’s what gives bread that chewy and crunchy exterior. It’s definitely worth the extra time while you sleep! I made my starter on Friday afternoon, and by Saturday afternoon I was munching on the most flavorful and crispy baguette I’ve had in my life! The only special equipment you need is a couche to help the baguettes retain their shape while they rise. They’re relatively cheap (around $20), but you can totally use a flour sack dish towel instead. Word to King Arthur Flour for another winning recipe! To make the starter: Mix everything together to make a soft dough. Cover and let rest at room temperature for about 14 hours; overnight works well. To make the dough: Mix and knead everything together — by hand, mixer or bread machine set on the dough cycle — to make a soft, somewhat smooth dough; it should be cohesive, but the surface may still be a bit rough. If you’re using a stand mixer, knead for about 4 minutes on medium-low speed (speed 2 on a KitchenAid); the finished dough should stick a bit at the bottom of the bowl. Place the dough in a lightly greased medium-sized bowl, cover the bowl, and let the dough rise for 3 hours, gently deflating it, folding the edges into the center, and turning it over after 1 hour. Let rise additional 2 hours. Turn the dough out onto a lightly greased work surface. Gently deflate it, and divide it into three equal pieces. Round each piece of dough into a rough ball by pulling the edges into the center. Cover with greased plastic wrap, and let rest for 30 minutes (up to 1 hour). Working with one piece at a time, flatten the dough slightly then fold it nearly (but not quite) in half, sealing the edges with the heel of your hand. Turn the dough around, and repeat: fold, then flatten. Repeat this whole process again; the dough should have started to elongate itself. Click here for a video. With the seam side down, cup your fingers and gently roll the dough into a 16″ log. Taper each end of the log slightly to create the baguette’s typical “pointy” end. Place the logs seam-side down onto a lightly greased or parchment-lined sheet pan or pans; or into the folds of a heavily floured cotton dish towel (or couche). Cover them with lightly greased plastic wrap, and allow the loaves to rise until they’re slightly puffy. This should take about 45 minutes to an hour at room temperature (about 68°F). Towards the end of the rising time, preheat your oven to 450°F with a cast iron pan on the floor of the oven, or on the lowest rack. If you’re using a baking stone, place it on a middle rack. Start to heat 1 1/2 cups water to boiling. If your baguettes have risen in a dish towel or couche, gently roll them (seam side down) onto a lightly greased (or parchment-lined) baking sheet. If you plan on baking them on a baking stone, roll them onto a piece of parchment, and lift the parchment onto a baker’s peel. Using a baker’s lame (a special curved blade) or a very sharp knife held at about a 45° angle, make three to five long lengthwise slashes in each baguette. Load the baguettes into the oven. If you’re baking on a stone, use a baker’s peel to transfer the baguettes, parchment and all, onto the hot stone. Carefully pour the boiling water into the cast iron pan, and quickly shut the oven door. Bake the baguettes — on the pan, or on a stone — for 24 to 28 minutes, or until they’re a very deep golden brown. Remove them from the oven and cool them on a rack. Or, for the very crispiest baguettes, turn off the oven, crack it open about 2″, and allow the baguettes to cool completely in the oven, until both baguettes and oven are at room temperature. 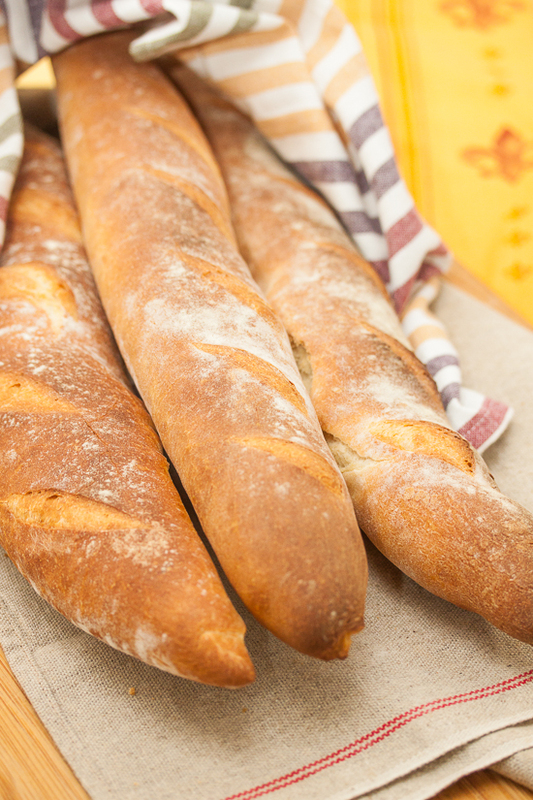 Store any leftover baguettes in a paper bag overnight; freeze for longer storage. Thaw and reheat just before serving. I hate you because now I have to try and make these.